Wow! It's mid-March already! Where has the year gone?? It's around this time of year that our shiny, hopeful goals, dreams, resolutions and intentions for 2018 are growing cobwebs in a corner of the metaphorical junk room of our lives, dying a slow and silent death. And that's a shame. Because you wouldn't have set your goal or dreamed your dream if it didn't hold a special place in your heart. So I am going to show you how to keep your goals and dreams alive! If you don't keep your dreams alive you won't achieve them, and I would LOVE to see you achieve your dreams! 1. Make sure your goals are SMART! I wrote about this HERE and you need to read it (and get your FREE PRINTABLE)!!!! 2. Turn each goal into an Actionable Plan! I wrote about this HERE (and created TWO AWESOME FREE PRINTABLES!!!) and if you haven't checked it out already, check it out now! I'll be here waiting for you when you're done! 3. Display your goals and dreams where you can see them! You can use words, pictures, songs, a screensaver on your phone or computer, a post-it note on your bathroom mirror (which will fall off and annoy the knickers off me, but if it's your thing then go for it). They key is to pepper your life with triggers to help you keep your goals and dreams front of mind. 4. Track and record your progress regularly. In business there is a saying: "What gets measured gets managed", and it's just as true in our personal lives. So block out time to measure your progress regularly! I like to use a journal for this, and if there is enough demand for this from my newsletter subscribers I will make the one I use into a cute printable and put it in the Members section. (Oh, and if you want access to my Members section, just CLICK HERE and sign up for my weekly newsletter!). Enlist a friend or coach to report your progress to, and help you stay motivated. Be a little bit judicious in who you choose, as sometimes our growth can be a bit confronting for our friends and loved ones. But put your feelers out and if you think someone might fit the bill, ask them if they would be willing to be your accountability buddy! Or for some supercharged accountability, hire me! I bring just the right amount of understanding and a bit of tough love when you need it. So if you are ready to invest in getting - and staying - on track, feel free to reach out to discuss my rates and packages! 6. Take consistent action each day. This is arguably the most important step. In fact, I CANNOT EMPHASISE THIS POINT ENOUGH! Some studies have shown that consistent action is the thing which distinguishes those who achieve their goals from those who don't. So take consistent steps every day! I have a name for this: I call these things my NNDR's (Non-Negotiable Daily Rituals). I wrote about NNDR's HERE, and I created an awesome FREE PRINTABLE for you too! 7. Don't expect it to happen overnight! Patience is a virtue dahlinks, especially when it comes to achieving our goals and dreams! Too often, people fail to achieve their goals because they become discouraged by slow progress, stalls and plateaus. It all feels too hard, they ask themselves why they are sacrificing so much for so little return, and then they give up. Successful people remember than even baby steps are progress! You are a successful person, so you need to remember this too. Even tiny baby steps are progress, And a stall is infinitely preferable to a backslide or (gasp!) abandoning your dreams. Think more tortoise, less hare! I wrote about this HERE. And I also created a FREE NOT-TO-DO LIST PRINTABLE to help you list the things that are making you feel bad about yourself, drain your energy, absorb too much of your time, and generally keep you from living your best life. When deciding how to spend your hours and days, keep your goals front-of mind. If it's not going to move you further along in your journey to health, happiness and success (however you choose to define it!) then leave it for later, after you have done the important stuff. We are busy, busy, BUSY and it is all too easy to let "urgent" busywork override the tasks that are truly important. Don't let that happen to you!! At the end of each day, ask yourself: did I do something that is going to pull me forward, towards my goals and dreams? AND HERE'S A PRO TIP: Don't get your list of goals mixed up with your To-Do List! There are lots of things we all have to do each day, week and month. And most of these tasks probably belong on some kind of To-Do List. Things like renewing your licence, paying your insurance, updating your blinds.... These are things that keep your life humming along, and you gotta do them (it's called Adulting and its wildly underrated, dahlinks). But these aren't the things that will propel you along the road to achieving your dreams. It's about balance really. We need to make sure we keep our lives humming along and get our chores done, but we also need to make sure we keep our eyes on the prize and prioritise the things that will take us one more step closer to our dreams!!! So when you are writing your daily, weekly or monthly To-Do List, make sure you are mindful of whether each task is part of your goal-achieving plan. And make sure you include - and prioritise - the daily, weekly and monthly action steps that will get you closer to your goals! I also have a general To-Do List, where I dump everything I need to do (so nothing falls off my radar), but my Daily To-Do List is what I create each day to make sure I not only keep my life humming along, but I also move towards my dreams every day (even if it's a baby step!). 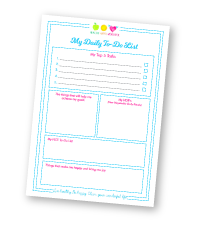 I have made my own Daily To-Do List into a FREE PRINTABLE, EXCLUSIVE TO MAILING LIST MEMBERS!!! And I've also put a big "brain dump" To-Do List Printable in there too, so you can write EVERYTHING down and not lose track of things.